I was a reluctant Tweeter, but thought I would stick a toe in the microblogging pool by creating a Twitter account for the Barnard Library. I want to share that experience and give you just a small amount of background on Twitter and microblogging. First, the background: Twitter is a microblogging tool. Microblogging is about speed and brevity. You can tell your patrons about a new database, share a search tip, announce an event, or post a link, but the trick is that you have a limited number of characters to do it. 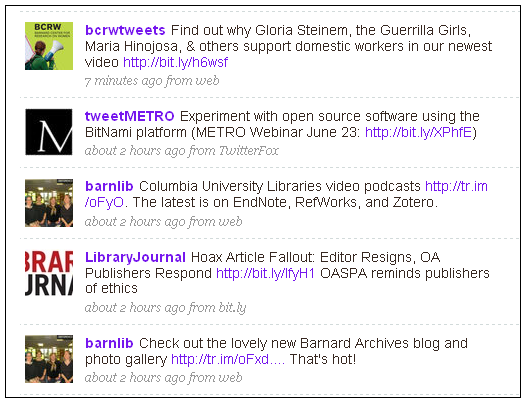 In Twitter's case that number is 140.
barnlib is the account I set up for the Barnard Library, so you'll see that your own posts show up in your queue, as well as those from people and organizations that you follow. If you want to see just our posts, you can view them at http://twitter.com/barnlib. Another way to share or view your Tweets is to feed them directly to a website, which is the method that I'm most excited about for the library account. They've created what they call an HTML widget that generates the code for you to just copy and paste into your website. –You don't need to be an HTML expert, but you do need to be able to edit content on your site. I tweaked the code I got from Twitter just a little. I wanted to get rid of "Twitter Updates," and I wanted my headline to be "FOLLOW BARNLIB ON TWITTER," not, "follow me on Twitter." At first I only wanted two Tweets to show up on the page at a time, and the default is five, so I also needed to change that. (Incidentally I'm back to five now.) Finally, I wanted the headline to be center justified, not right. See what I've put in bold above, and I bet even if you're not a coder you'll be able to figure out how to modify the HTML to make some of my changes. That's not so hard, right? And voila!, the site updates automatically with every new Tweet. I don't have to do another thing to the HTML. The posts don't seem to want to obey my style designations, either font size or type. And worst of all, the page can be slow to load. The page doesn't hang forever, but there is a noticeable lag. There is a lot more to discuss about using Twitter, but I wanted to give a taste to folks who might have needed a little nudge to give it a try. There is a world of tools and applications for Twitter. 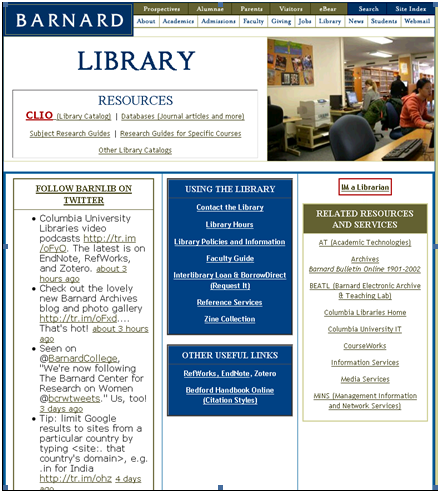 Try this bibliography of online Twitter resources for librarians if you want more information. Jenna Freedman, who Tweets at http://twitter.com/barnlib and is also the Coordinator of Reference Services and Zine Librarian at Barnard College in New York City. PS I know there is more to say about the CSS and HTML, but programmers, keep it in your pants. This article was not written for you. The people for whom it was written don't care. The preceding article was originally published in The U*N*A*B*A*S*H*E*D Librarian, a magazine for which I am a Contributing Editor, though I haven't contributed very much lately. Interested in writing for us? Pitch me something! Freedman, Jenna. 2009. "Twitter as a Tool for Website News." The Unabashed Librarian, no. 151: 7-10. This is the single most helpful thing I've read all day! Thank you!